Defensive positioning in baseball has changed dramatically over the years as managers are looking at every detail of the game. Getting advanced statistics on the batter and shifting players into the correct defensive positions are a few examples. The defensive shifts implemented during the game can be interesting to see for fans – new and old — of baseball. In a game against Washington State, Oregon head coach George Horton positioned his Ducks defensively around the diamond depending on the situation — hitter/count/outs. In this analysis, I will be taking an in-depth look at two defensive shifts the Ducks implement on defense. Despite the bases being loaded for Washington State, the players on defense for Oregon are in normal depth positioning — seen above. Since there are two outs in the inning, the play is to be made at first for the out. 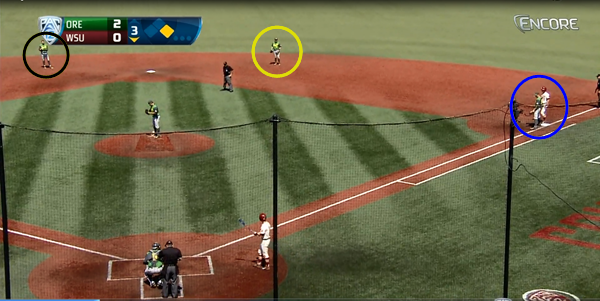 Look at the position of Oregon’s second baseman, Daniel Patzlaff — blue circle, above — standing near the edge of the outfield grass. Patzlaff is also standing away from second base so he can cover the gap between he and the first baseman — should the ball come his way. 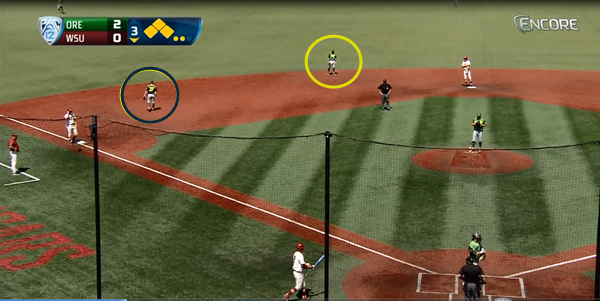 Notice shortstop, Mark Karaviotis — yellow circle, above — played a few steps in front of the outfield and third baseman, Mitchell Tolman — blue circle, above — played inwards and away from third base. The two are then positioned to cover the gap from a ball going to left field. 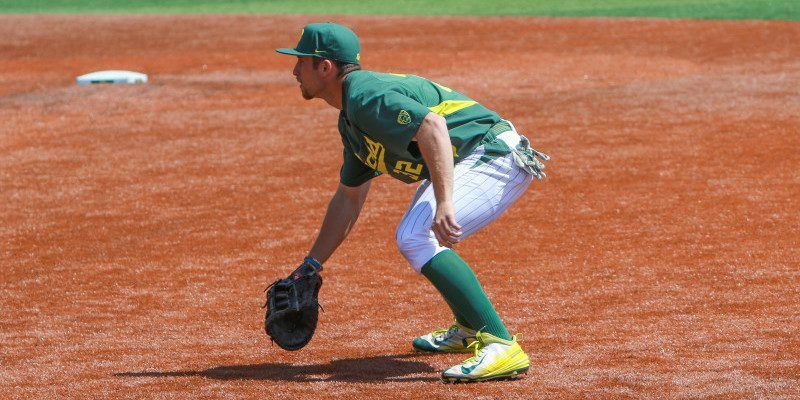 This style of positioning allows the infielders time to cleanly field the ball and make a play for the out. The GIF above shows Tolman’s hustle to field and scoop the ball to pitcher, Josh Graham, for the out at first base. 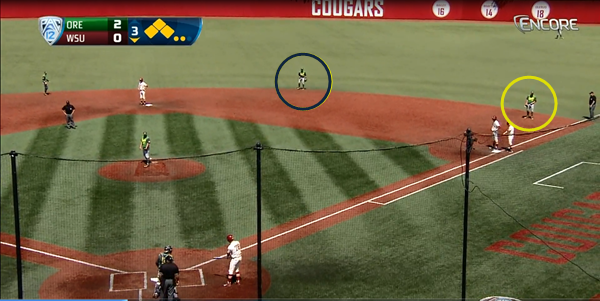 With a runner on first base for Washington State, Oregon shifted their defense in hopes of a double play. In the image above, notice the position of Karaviotis — black circle — Patzlaff — yellow circle — and Heineman — blue circle. Karaviotis and Patzlaff are playing near second base and shallow. The two players are in position to start — and turn — a double play. Now, in order for a chance at a double play, Tolman needs to hold the runner at first base. If Tolman chose not to hold the runner, the chance of stealing second base or a possible hit-and-run is high — which eliminates the potential of a double play. The third baseman cannot be seen in the image, but he is playing close to third base — ready to charge on a possible bunt attempt. Unfortunately, a double play did not happen in this instance — seen in GIF above — but it shows the position and the start of turning a double play. Patzlaff had to wait on the ball bounce before he could field, turn, and throw a strike to Karaviotis to get the lead runner out at second. If the ball came quicker, a double play could have been executed. This style of positioning is a good strategy for turning the double play, but a disadvantage is a wide gap between the first and second basemen — which is where the hitter is looking to hit the ball. There is also a wide gap between the third baseman and shortstop.